On Monday, February 4th, the Hayward Rotary Club presented a special early evening meeting. A Portuguese inspired dinner and sampling of wines from Portugal were just some of the wonderful things we enjoyed! 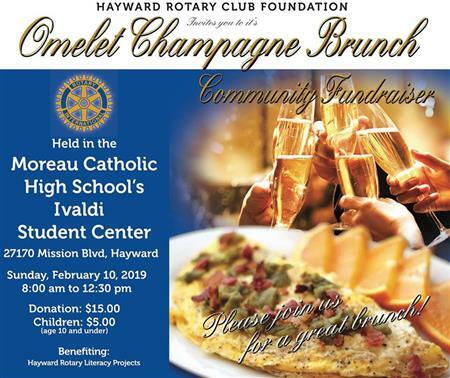 Back by popular demand....Hayward Rotary Club proudly presented the 11th annual Champagne Omelet Brunch! We served over 400 mouthwatering omelets made to order by Hayward Rotarians and celebrity chefs. Attendees enjoyed raffles, champagne, mimosas, beverages and so much more. 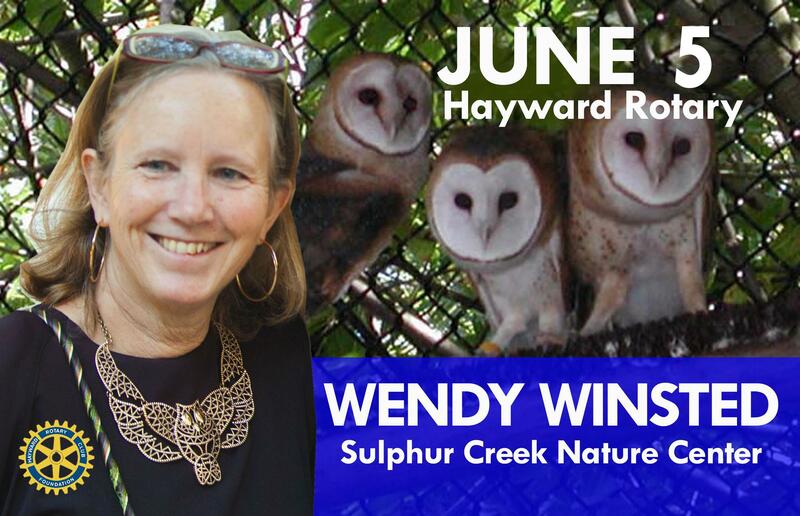 All proceeds fund Hayward Rotary's Literacy Projects and Community Grants benefiting Hayward youth and families. Thank you for your interest in the Hayward Rotary Community Grants Program! Your applications packet is available starting November 25, 2018 and is due on December 31, 2018. The Rotary Club of Hayward enjoys supporting not-for-profit organizations that benefit members of our community and has been doing so since 1922. Please click on this link for your grant application. Hayward Rotary Club's annual "Child Spree" back-to-school shopping event,provided 100 Hayward children the back-to-school clothing and supplies they needed for their upcoming school year. All 100 participating children have been identified in partnership with the Hayward Police Department Youth and Family Services Bureau. 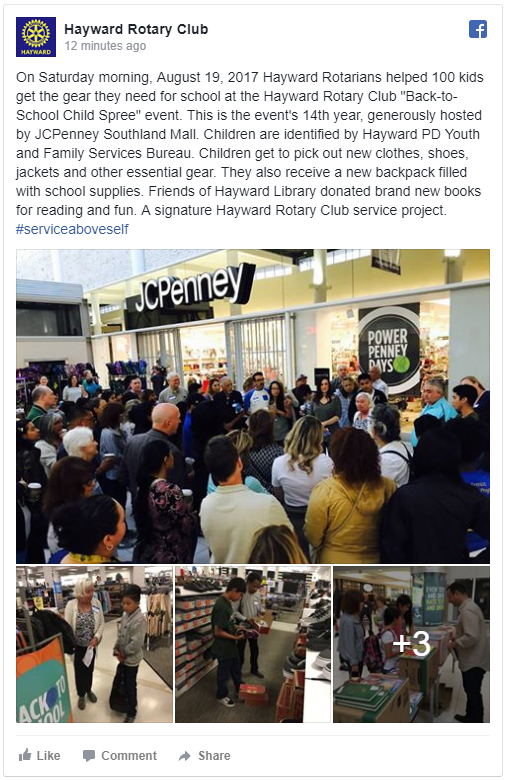 Event sponsored by Hayward Rotary Club in partnership with JCPenney, Southland Mall, and Friends of Hayward Library. Saturday, Aug. 18, 2018 at 6:30 a.m. Member spotlight: CONGRESSMAN ERIC SWALWELL, Hayward Rotary Club member since 2013. Photo: Congressman Eric Swalwell meets with constituents in Hayward at Eko Coffee and Tea House in 2016. 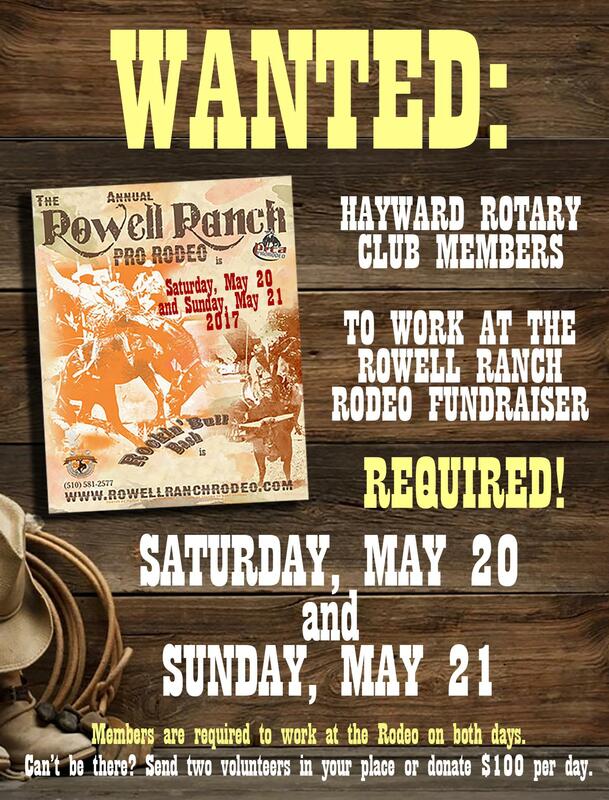 Hayward Rotary Club will once again operate the food and drink concessions at the Rowell Ranch Rodeo, taking place in 2018 on May 17, 18, 19, and 20. Proceeds from the food and drink sales help our charitable work in the Hayward community, including Community Grants to local nonprofit organizations. Volunteers are wanted to help us sling burgers, fries, and soft drinks to the thirsty crowd! 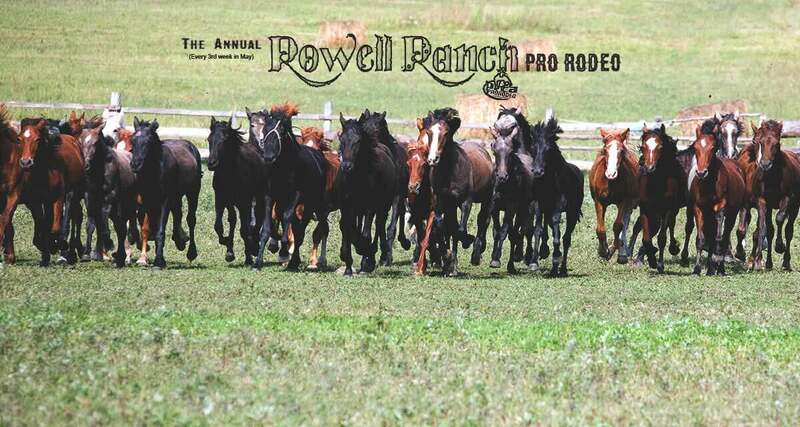 Join in the fun, get to know Rotary Club members, and experience western heritage watching real cowboys "at work and play"; all while we raise money for great causes. 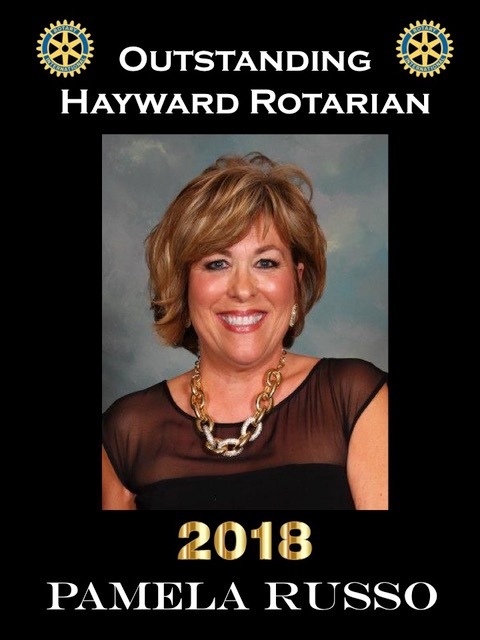 The Richard W. Bowman Outstanding Hayward Rotarian Award is given annually to the Hayward Rotary Club member who best exemplifies the Rotary motto of “Service Above Self”, and whose contributions in the five Avenues of Service distinguish them among their peers. It is the highest honor Hayward Rotary Club bestows on its Members. 'Tis the Season of Giving - Or is it? 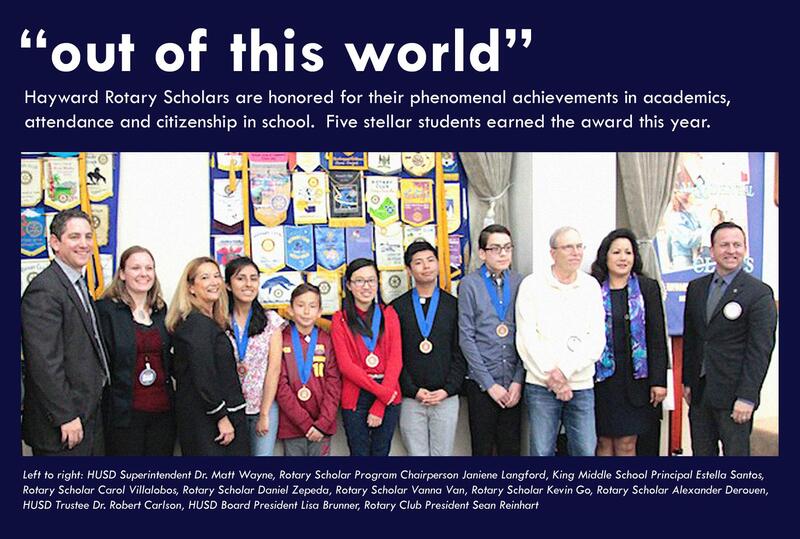 The Hayward Rotary Scholar awards recognize students who demonstrate extraordinary skill and achievement in school. The award is bestowed upon Hayward students who achieve perfect scores on their standardized tests, perfect attendance, and perfect citizenship at school for a full year. 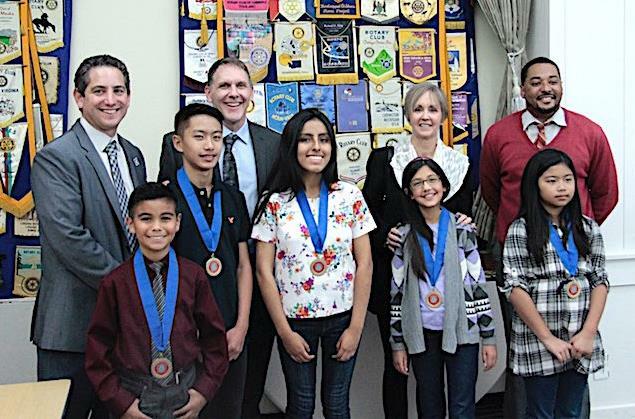 In 2017, five students achieved Hayward Rotary Scholar status. We are Hayward’s premier service club since 1922, over 90 members strong. We are a non-partisan, non-political group of people united in giving back to our community. Hayward Rotary Club members come from many diverse walks of life. We are leaders in business, education, government, nonprofit, and community service. Do you have what it takes to become a Rotarian? Learn more about who we are and how to become a Rotarian by visiting our weekly meetings and our website. Visit our membership page. 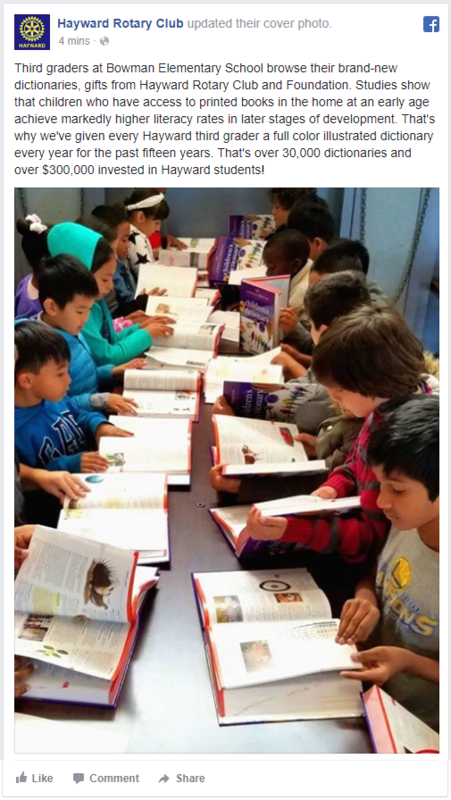 This past October, Hayward Rotarians gave every Hayward third grade student - over 2,000 in all - the tools they need to grow their literacy skills for a lifetime. We are celebrating our 17th year of the Children's Literacy Project. Here's a look at the results. 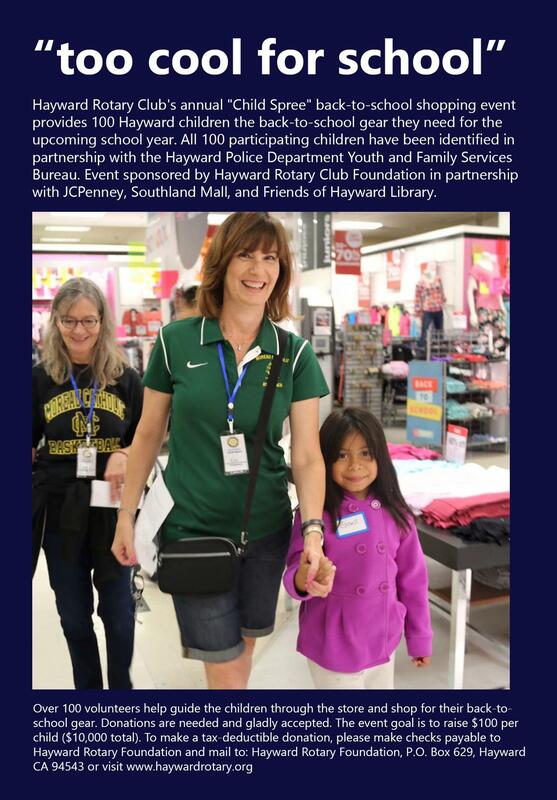 Each year in August, Hayward Rotarians help 100 kids get the gear they need for school at the Hayward Rotary Club "Back-to-School Child Spree" event. The 2017 event was a smashing success. View photos from the event. President Sean Reinhart has officially survived his year as Rotary Club president, and (barely!) managed to defend the Rotary Bell against multiple contenders who tried to steal the prize. Here's a video recap of the adventure. Turn up the sound for maximum triumph! Russell City was an unincorporated area of Hayward, a community of modest houses and small farms along the bay. In its heyday, Russell City was famed for its clubs with dirt floors, bootleg electricity and a steady stream of musicians playing a style of Delta Blues. During the early part of their careers, artists such as Big Joe Turner and Big Mama Thorton played Texas, Arkansas, and Louisiana style blues in Russell City. 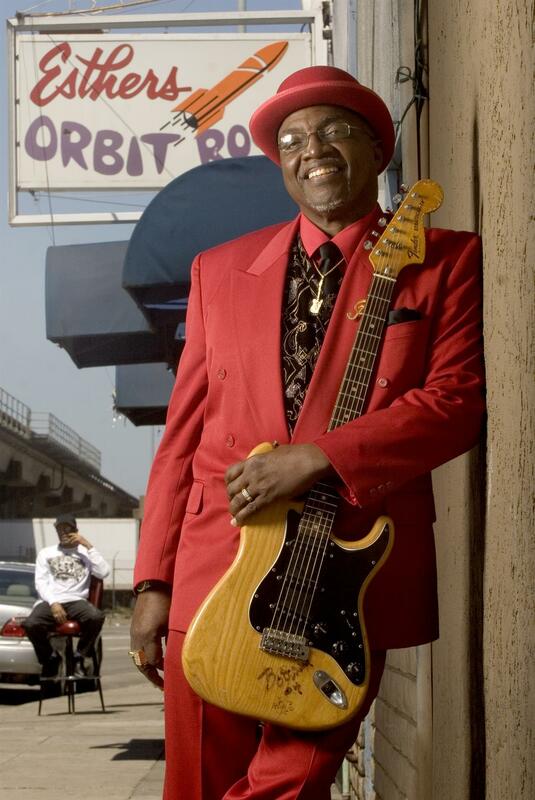 West Coast Blues music eventually influenced the traditional sound when horns replaced the harmonica and West Coast Blues was born. What new projects and policies are coming down the pike in Hayward? How does the city government work with partners in the private sector to build a stronger community? Who will the next generation of Hayward leaders be? Where can we join the conversation? 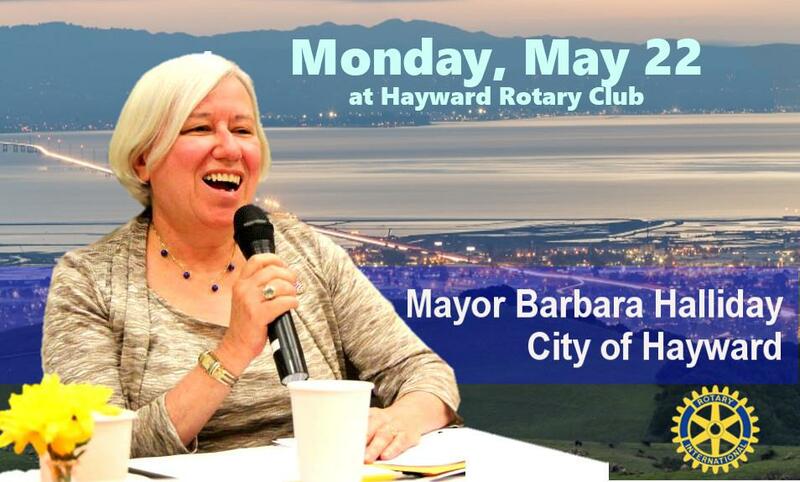 We're honored to have our friend, Mayor Barbara Halliday deliver her popular keynote address, "State of the City Update," at Hayward Rotary Club, Monday at 12:00 noon. Please join us for this special luncheon event. "State of the City Update"
Congressman Eric Swalwell will be our featured guest at the Hayward Rotary Club luncheon at 12:00 noon on Monday, May 8. The Congressman will present his keynote address, "Washington Update." Please join us for this special luncheon event. 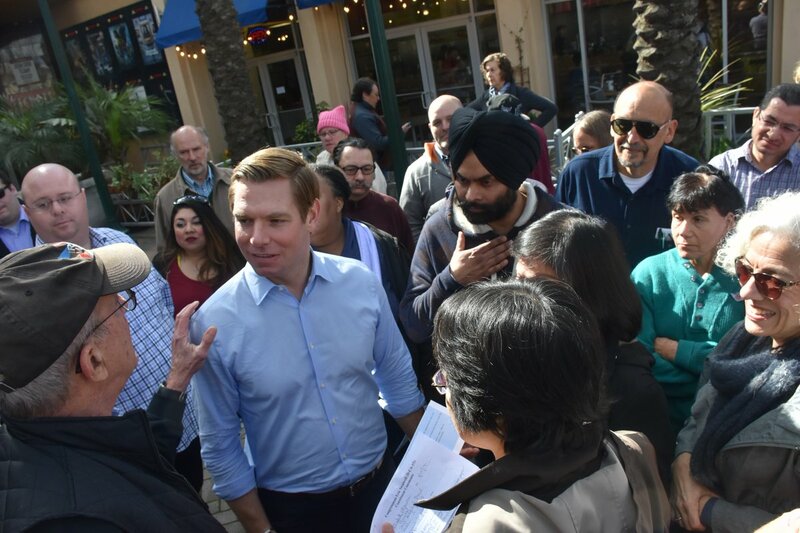 Growing up in what now is California’s Fifteenth Congressional District taught Eric Swalwell a lot about hard work,strong principles,and planning for a brighter future. The oldest of four boys and son to Eric Sr., a retired police officer, and Vicky, who works as an administrative assistant, Swalwell was raised and attended public schools in the East Bay. A Division I soccer scholarship was his ticket to becoming the first person in his family to go to college. After earning undergraduate and law degrees from the University of Maryland, he returned to the East Bay to serve as a prosecutor in the Alameda County District Attorney’s Office for seven years. He then was elected to the Dublin City Council. Eric Swalwell in 2012 was elected to the U.S. House of Representatives representing California’s Fifteenth Congressional District which includes Hayward. Now in his second term, he’s working hard to bring new energy, ideas, and a problem-solving spirit to Congress, with a focus on advancing policies that support equality, opportunity, and security. 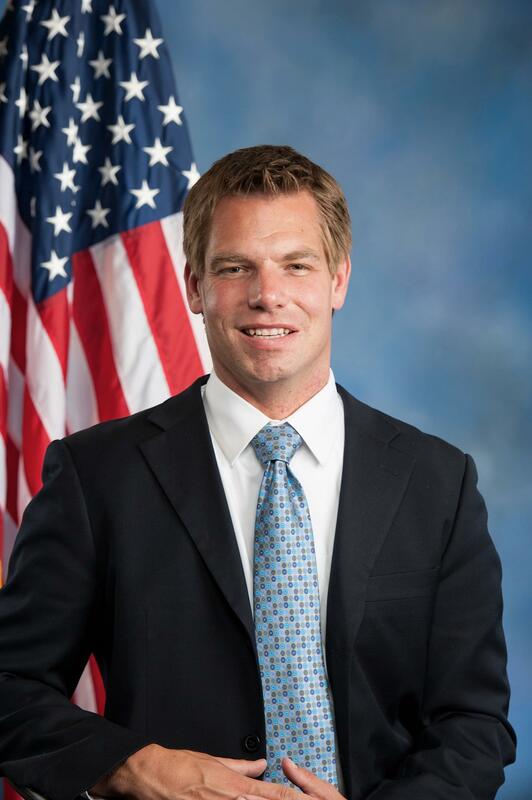 Congressman Swalwell serves on the House Permanent Select Committee on Intelligence, and believes protecting Americans is Congress’ most solemn duty. He is the top Democrat on the Subcommittee on the Central Intelligence Agency (CIA), responsible for the oversight, policy, activities, and budget of the CIA. He also serves on the Committee on Science, Space, and Technology, where he addresses climate change and advocates for renewable energy. 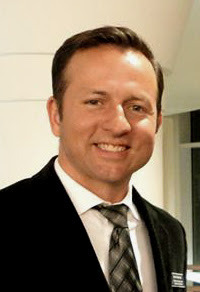 Sean Reinhart is President of Hayward Rotary Club. He will deliver the annual Club Assembly presidential address on April 24, 2017. 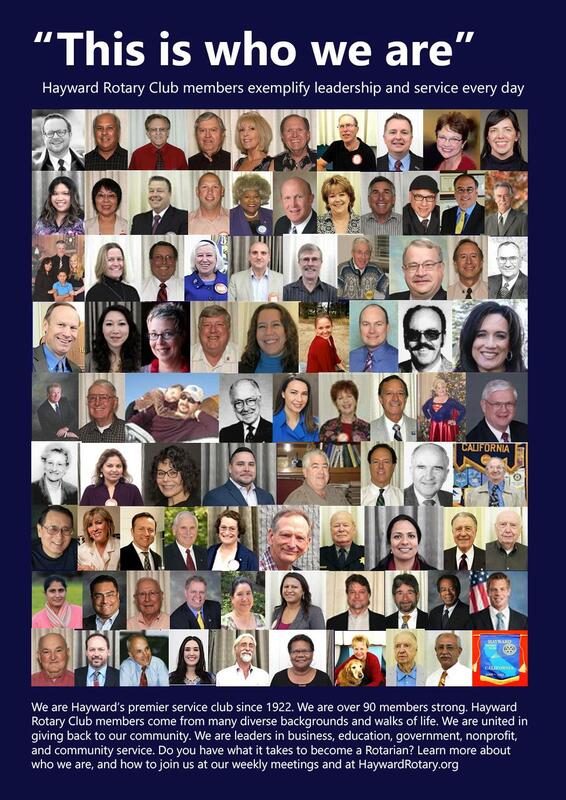 Hayward Rotary Club is fast approaching its 100th year of service to the Hayward community. The Club has deep roots and a rich legacy in Hayward going all the way back to the turn of the 20th century in the early 1900's. Today, at the dawn of a new 21st century, the world around us is changing more rapidly than ever before. The community of Hayward is experiencing incredible change, with new growth and progress developing at a pace unlike any we have ever encountered in our lifetimes. What does the future hold for the community of Hayward? What is the Rotary's Club's role in that future? We are at a unique time in history. Future generations will one day look back at this time with inquiry and wonder. The steps we take today will have a profound effect on generations to come. Join the conversation as we explore these questions and more from our unique vantage point in history. Sean Reinhart is a long time Hayward native and public servant. He grew up in Hayward's Eden Gardens and Palma Ceia neighborhoods, where he proudly received his education at Hayward public schools including Mt. Eden High School, Chabot College, and California State University, Hayward where he earned his Bachelor's degree in English. He earned his Master's degree in Library and Information Science from San José State University. Mr. Reinhart considers himself fortunate to have found opportunities to work since his first job age 16, which enabled him to earn and pay his own way through his higher education. He has a long career in public service including the past nine years with the City of Hayward as the Director of Libraries and Community Services overseeing the City's public libraries and education programs, social services and community development block grants, and affordable housing. He joined Hayward Rotary Club in 2010, and was elected to the Board of Directors in 2012. He was elected President of Hayward Rotary Club in 2016. 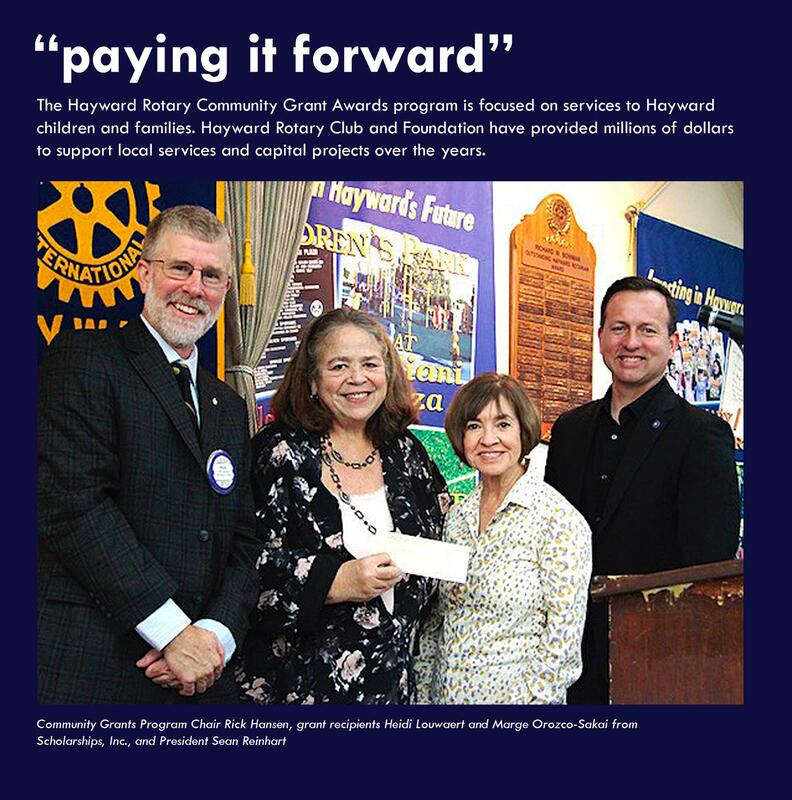 Hayward Rotary Club is the premier service organization serving the Hayward community since 1922. Our weekly luncheons feature the best and brightest keynote speakers. Contact event chair George Pacheco or volunteer coordinator A.T. Stephens. (3) Excellent behavior and role modeling for peers at school. HAYWARD, CALIF -- Last Saturday, more than one hundred students received new clothes and a backpack full of school supplies thanks to the Hayward Rotary Club’s annual Child Spree program. 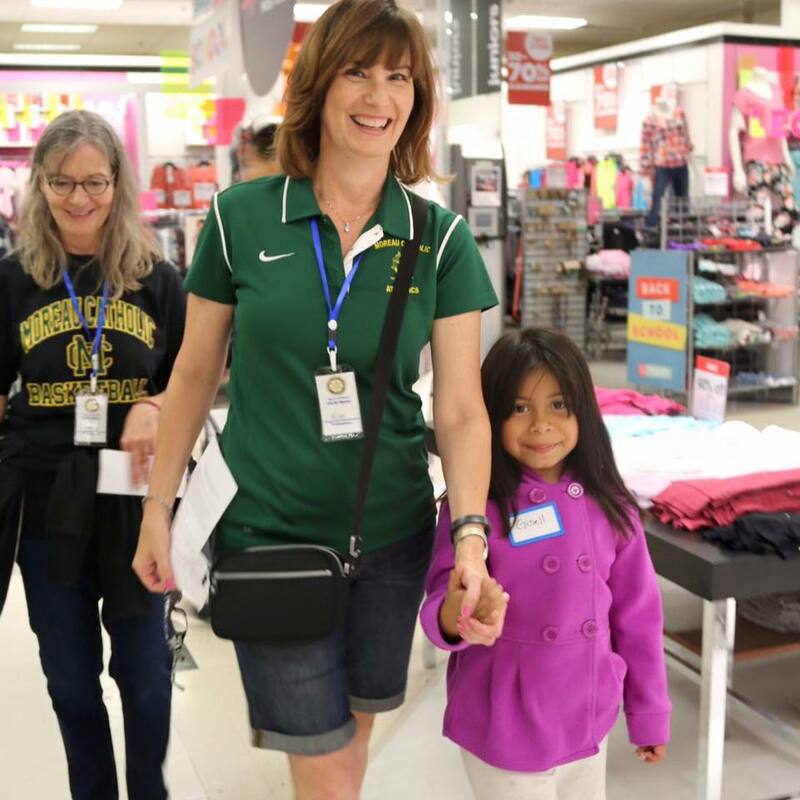 On Saturday, Aug. 22 at 7a.m., eager K-8 students met at JC Penney at Southland Mall and were paired with a Rotary Club member or other community volunteer. Together, using a list of needed items identified by the parent and a $100 gift card, they purchased essential clothing needed to start school. JC Penney offered 25 percent off the entire purchase and waived sales tax, so the children were able to purchase more essential back-to-school clothing. JC Penney staff volunteered to work the early shift in order to share the joy with the children and their parents and the Nestle kiosk opened early to offer discounted coffee and snacks for the families. Student participants were identified in partnership with the Hayward Police Department’s Youth and Family Services Bureau. At the conclusion of their shopping spree, the students picked out a backpack and book donated by Friends of the Hayward Library. During the event, parents and guardians were able to participate in a resource fair with tables from Hayward Adult School’s Youth Enrichment Services, Tiburcio Vasquez Health Center, Hayward Area Recreation and Park District, Life Chiropractic College West, Hayward Library’s Literacy Plus, Hayward Promise Neighborhood, Hayward Police Department’s Youth and Family Services, and Kinship Support Services. More than 200 community members joined Hayward Rotary in this project, including staff from Moreau Catholic High School, volunteers from the Boy Scouts of America, Chabot College students, the Cal State East Bay volleyball team, and Redwood Chapel Community Church. In addition to JC Penney, businesses and organizations who helped to sponsor the project included Fremont Bank, Calpine, Costco Wholesale, Give Something Back Office Supply, Kaiser Permanente, United Association Local Union 342, Sakura of America, and Friends of Hayward Library. Wear your best dragon colors. Delicious appetizers provided by Cannery Cafe. 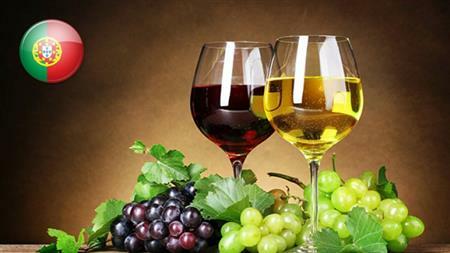 $5 entry includes one Dragon Martini or beer/ wine/ soft drink. Sponsored by the Rotary Clubs of Castro Valley, F.U.N. Sunset, Hayward and San Leandro, with generous support from the Hayward Area Historical Society. Hayward Rotary's Annual Omelet Brunch is a Flipping Success! Hayward Rotarians and their guest Chefs gathered under the Grand White Tent at St. Rose Hospital to make Omelets and serve our community guests a delicious, low cost Champagne Brunch to raise money for our Community at the Hayward Rotary Foundation's 4th Annual Champagne Community Fundraiser Brunch. Happy 90th Birthday Hayward Rotary!